Imperial College London hosted a showcase of how innovation and new ideas could help address major environmental issues. 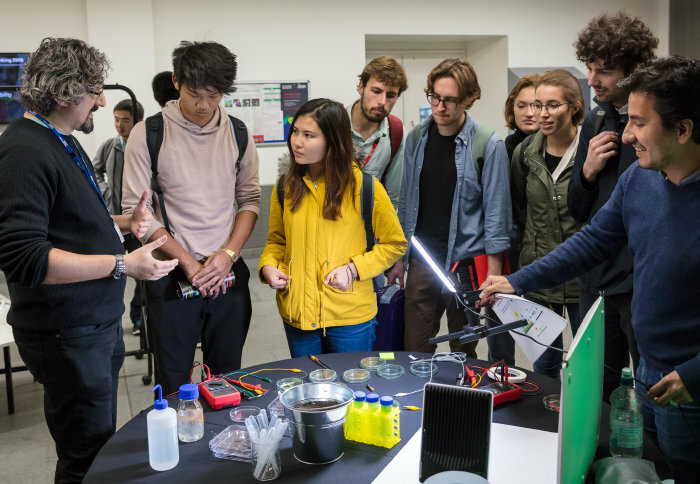 Imperial Lates celebrate the latest in science and engineering at Imperial – bringing the public together with world leading minds in their respective fields, who not only love what they do, but also love sharing their work with new audiences. Taking place during the country's first ever Green GB week , the after-hours event, called Greenovate , gave visitors the opportunity to see inventions for greener living by Imperial entrepreneurs, help shape future innovations with an ideas workshop and discuss how to tackle London’s air pollution. One of the researchers sharing their work was Claudio Chesi, Research Postgraduate in the Department of Chemical Engineering. Visitors explored the microscopic structure of wood that Claudio studies by making autumnal artworks from leaf rubbings and traced images, while learning how waste organic matter can be turned into useful biomaterials and fuels. Speaking after the event, Claudio said: "Working in the lab and in the office for so long, I believe it is crucial to take what we do out of the lab and share what we do with the public. It was extremely satisfying to see how much people were keen to understand more about what we do. "Many green ideas have failed because society did not have the right mindset to support them, and this is why it is crucial for us to share what we do as researchers with the public. Only by encouraging this connection between science and people we can really make great things happen, together." "Engaging and informing the public is vital"
“Usually in science, people stay in their field, but events like this are an opportunity for people from different areas to share their skills,” Mawahib added. Fellow visitor Pravat came to the event out of curiosity and interest. He found the event fantastic as “it shows how the technology, which are currently in prototype form, can be scaled up for real-world interest." Visitors were also able to quench their thirst for a more sustainable vision of the future by trying samples of a specially created eco-friendly beer, CObrew. The beer was produced by PhD students on the Science and Solutions for a Changing Planet DTP programme, who developed CObrew to engage consumers with the environmental impact of everyday products. Brewer and research postgraduate, Luciana Miu, said: "We need disruptive solutions to radically change the impact of the things we do on our fragile climate system. Believe it or not, a pint in a pub is one of those things - and therefore it's time to create a brewing industry that quenches our thirst for beer without parching the planet." Inside a nearby lecture theatre, visitors joined special guests from campaigning organisations, MPs and inventors to discuss how ordinary people can harness the innovative and technological expertise at universities like Imperial to tackling London’s air pollution crisis. Across the main entrance Aaron Koshy, a bioengineer and design engineering graduate from Imperial and the Royal College of Art, joined visitors at the Green Ideas Lab organised by Imperial's Centre for Cleantech Innovation . Seated around small tables, people listened as he presented his early-stage business idea for the first flushable and biodegradable sanitary product, called Polipop , and gave their feedback as potential future users of the product. Last year’s four Imperial Fringe evenings were enjoyed by over 2,000 visitors and included a journey to the stars celebrating the conclusion of the Cassini mission, an exploration of the future of AI , and an atmospheric evening of air science . This new after-hours programme of science returned this autumn with a new name, later time-slot and five evenings of discovery.